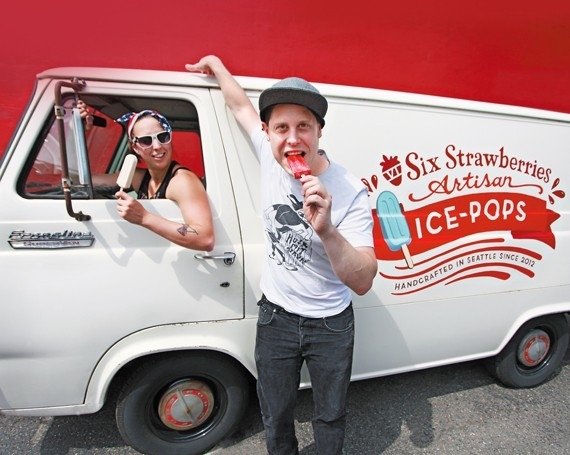 CLIENT : Will Lemke, a video producer and Vanessa Resler, an event DJ, started this company in 2012 selling pops out of a bike cart at farmers markets with energetic enthusiasm for creating unique treats that fit most dietary restrictions. So far they had done it all themselves, from the sales to the production to the logo, but by the time they contacted me in 2013, they were ready to up their game and expand their market. CHALLENGE : Originally they just wanted their existing logo to be painted on the 1960's Econoline van they had just purchased, but when I saw their corporate-y plain logo and heard their story I knew we needed something to make them stand out and complement the feel of the van. They weren't ready for a complete logo redesign so I incorporated their new logo into a design that put the visual of the pop forefront. The idea was to make the look kid friendly and present their company as the fun-loving unique product they were. They were so happy with the van designed they wanted to make these designs their permanent logos and to flesh this out into a full brand package. The first use of this design was on the side of their beautiful 1960's Econoline Pop Delivery Van and from there we painted the same design on their Pop Cart Cycle and eventually modified it to fit their Georgetown storefront window. These new vehicle billboards became huge successes for their company and got them featured in both The Stranger magazine and The Seattle Times. I designed, built and painted this storefront window in 2016. The handpainted window text was designed with sections to write in the changing flavors and toppings with chalk marker, and the main flavors stayed on a printed menu that matches their printed handouts. New business cards were the first step in bringing the new logo into a full brand. I wanted to keep with the retro-meets-contemporary, and bring some sophistication into the whimsical design and make the business cards a tool to really sell their product since events were really their highest earning form of sales. This had huge sucess. I came up with the idea of creating a promotional pamphlet for the company when I learned about how a big sales platform for them was their grocery store sales talks. 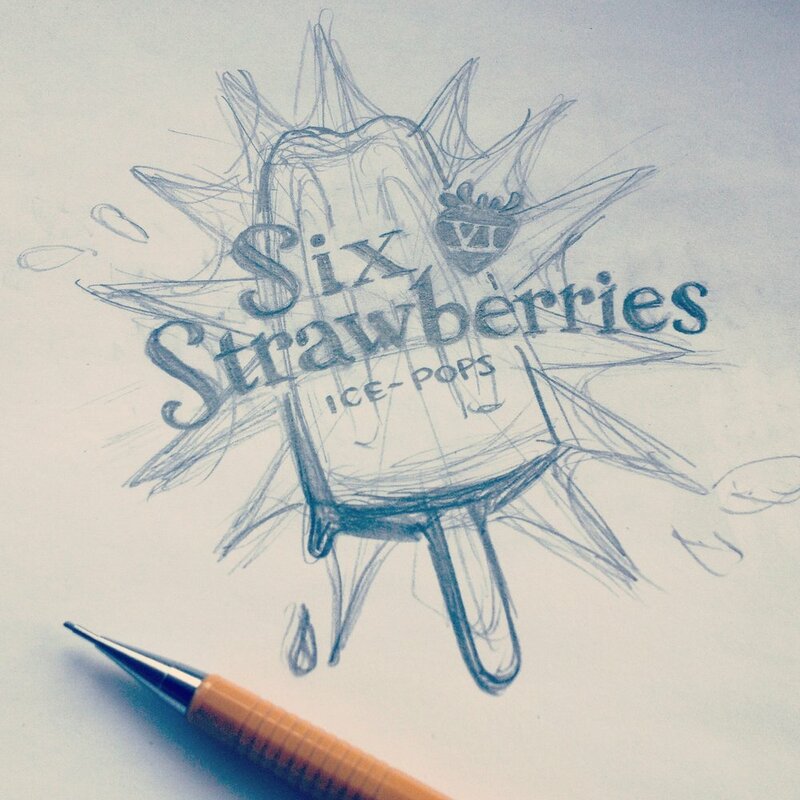 I felt like they needed something they could hand out to customers to tell them al the awesome features of the product, all the ways they could be purchased and the flavors in a fun/appealing way that wouldn't overwhelm the consumer but make them more interested. This rack card was our eventual solution and became an essential sales tool for the company that brought in big sales gains. 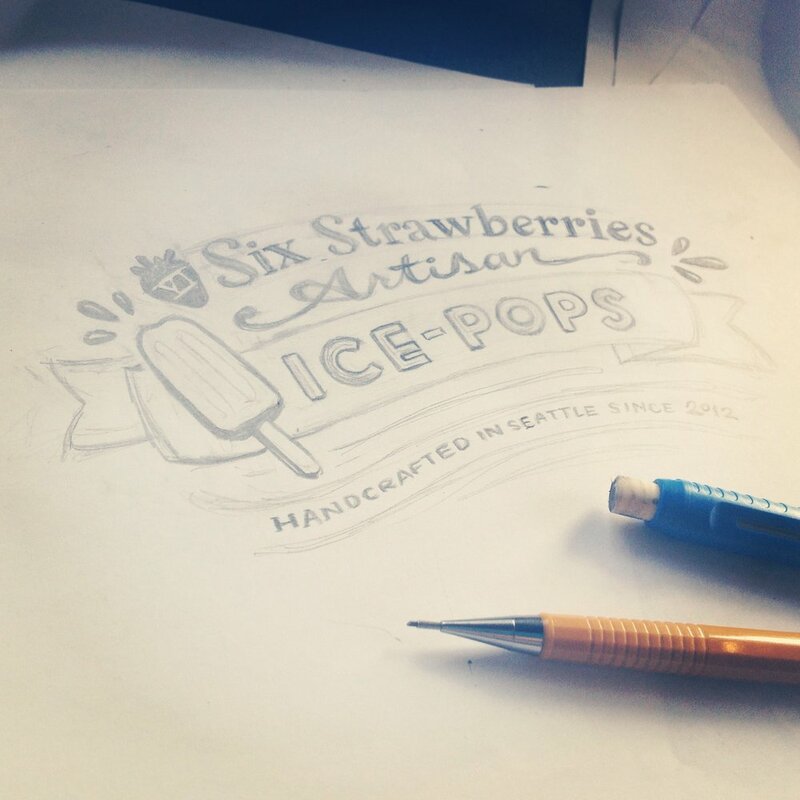 When I started with Six Strawberries, they were printing their labels themselves on a inkjet printer and not long after I started working for them, their volume had surpassed their ability to keep up with this so I found them a label company in Seattle and we mass produced their 8 main flavors, bringing a proffessional look to their physical product that was a huge help to in-store sales.